Why are Preventive Care Visits So Important? For many people, dental visits are only reserved for addressing apparent oral health issues. Thus, they may consider the maintenance of six-month appointments for preventive care as a waste of time and money. A dental cleaning that removes any plaque and tartar that have gathered on the teeth and along the gumline. Still, these appointments offer even more advantages. An initial perk of maintaining preventive care visits is that they will typically be fully covered by dental insurance companies. The long-term savings hold equal, if not greater, significance, though. 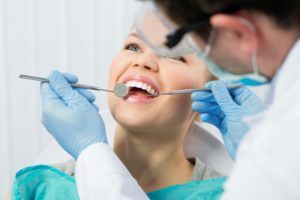 That’s because receiving examinations and cleanings on a regular basis are key ways to avoid costly dental procedures in the future that require a greater out-of-pocket contribution. In addition to saving money, you’ll also be able to prevent any unnecessary suffering and lost time. Thus, for around two hours of your life a year, you can reap phenomenal benefits! To get the most you can from each dental visit, it’s important to practice excellent oral hygiene at home. By brushing and flossing your teeth at least two times a day, you will be helping to limit the growth of bacteria in your mouth, which is key to maintaining excellent oral health. When performing oral hygiene, it’s vital to the wellness of your teeth and gums to use a toothbrush with soft bristles and to avoid any vigorous brushing. This helps to spare your enamel, which is the hard layer of your teeth that protects the more sensitive parts. Consistent attention to your dental care and a commitment to maintaining six-month visits, will amount to excellent oral health for years to come! A graduate of the UCLA School of Dentistry, Dr. Nelson Y. Howard has been providing dental care for over 30 years. As part of his constant dedication to excellence, he maintains professional affiliation with such organizations as the American Academy of Implant Dentistry, the Dental Organization for Conscious Sedation and others. Dr. Howard helps patients enjoy the best in oral health at his private practice, and he can be reached for more information through his website.